1984's Gremlins may be about destructive little monsters, and it has many of the elements of a horror movie, but this is horror played for laughs. There are also many parody elements which younger (even younger adult) viewers might miss, unless they were really paying attention during the 1980s. That's not to say the 1980s cultural elements being parodied need to be recognized to enjoy the film; they just add an extra element when viewers recognize them. Today's readers can fully enjoy the nonsense verse of Lewis Carroll, despite the fact that the contemporary poems he was parodying are all long forgotten. Look closely at Gremlins and you'll see nods to many of Steven Spielberg's films, especially ET and Raiders of the Lost Ark. Our story begins in Christmas season. Inventor Randall Peltzer (Hoyt Axton) is looking for an interesting gift for his son. In a strange little shop in Chinatown, he finds a Mowgwai. Cute little thing! A lot like a live teddy bear with great big bat-like ears. Keep them out of bright light. Don't let them get wet. And don't ever feed them after midnight. Any observer of movie formula knows that before the closing credits, all three rules are going to be broken, with disastrous results. Billy Peltzer (Zach Galligan) loves his present, and the Mowgwai named Gizmo is indeed an adorable pet. 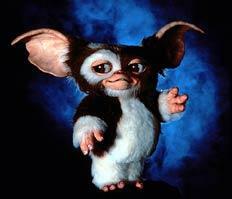 Very affectionate and making the most endearing little trilling noise, Gizmo is one of the cutest movie creatures ever created. But alas, Gizmo gets wet. The water causes little pellets of fur to pop off of him, and those pellets quickly develop into new Mowgwais. The new guys look a lot like Gizmo, but they behave very differently. They're like little furry juvenile deliquents on speed. Once they trick Billy into feeding them after midnight, watch out! They go into a cocoon stage, coming out larger, reptilian, and very, very nasty. And going on a rampage, cackling insanely all the while. 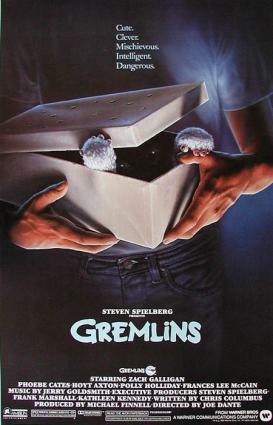 Gremlins was written by writer/director/producer Chris Columbus (Harry Potter and the Chamber of Secrets) and was one of his two debut movies released in 1984. He's obviously studied his chosen field, because we see a lot of movie 'conventional wisdom' here. There's the idealization of small town America, the wacky neighbors, the snow-covered postcard scene, and the disbelief in 'gremlins'. Young adult Billy works as a teller in a bank, has a sweet girlfriend Kate (Phoebe Cates), and a nemesis. Mrs. Deagle (Polly Holliday), the town's big fish in a small pond, comes across as the unacknowledged offspring of Mister Potter of It's a Wonderful Life and the Wicked Witch of the West of The Wizard of Oz, even gloatingly telling Billy how she's going to deal with his dog. Sweet little Gizmo never goes 'bad' and is as much a target of the creatures as the humans are. And remember, if they get wet, there are going to be a lot more of them. Gremlins was directed by Joe Dante and written by Chris Columbus.